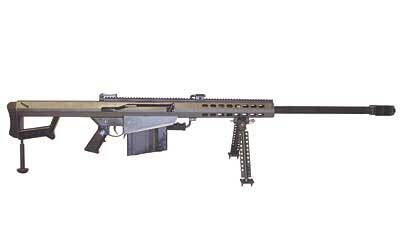 Email us for availability on 50 Cal Rifles. Demand for 50 Cal rifles has grown exponentially since the election. Rifle only. Semi-auto, 29" barrel. (Shown with upgrades.) Black, 10-rd magazine. 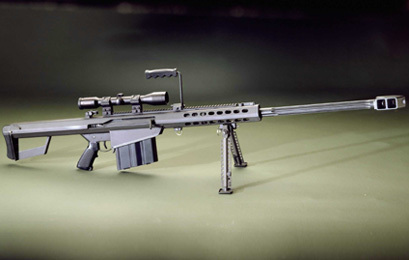 This is the Close Quarters entry model with a 20.6" barrel. ;) Quantities extremely limited. (Call for availability.) Black, 10-rd magazine. Barrett 99 Kit - 29"
Barrett 99 Kit - 32"
Bushmaster (Cobb) BA50 See Cobb below. POR 4 TNW M2 Semi-auto 50 cals are mounted on a beautifully refurbished military trailer. Call (714) 231-0330 for details! Trailer only, firearms not included. Little brother to the BFG-50. 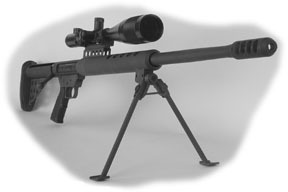 Includes bipod and scope mount/rings. All prices reflect a CASH discount of 5% and are subject to change without notice. Free with every purchase - we will mount and boresight your rings and scope when purchased from us. We will assist you in the selection of a carrying case best suited for your needs and can custom cut interior foam when needed free of charge when you purchase your firearms from us! All prices reflect a CASH discount and are subject to change without notice. Shipping/insurance additional.